by Alexandra Schexnayder, Article donated by the mane points horse resource center. One of the purest pleasures of owning a horse is taking to the open country. Wind in your hair, sun on your back, not a care in the world - not a care, that is, until you are rudely confronted with newly denuded land and the all-too-ubiquitous signage of a local developer. "This is happening all over the country, even in quite rural areas," says Kandee Haertel. She's the executive director for Equestrian Land Conservation Resource (ELCR), the three-year-old national organization dedicated to maintaining access to land for equestrian use. "We have got to stop taking access to land for granted," she warns. "That's why ELCR was formed-to encourage equestrians to work with local groups and ensure there will be open land for riding even after our generation has come and gone." Surely it's not as desperate as all that? Haertel is adamant that it is. One of Haertel's board members, Sophie Clifton, cites as anecdotal-but powerfully convincing-evidence the history of Phoenix, Ariz., where it was common to see people riding horses within the city limits only a few years ago. It's not just trail rides that ELCR, a partner of the prestigious Conservation Fund, is seeking to preserve. It's land used for stabling, showing, training, polo, hunting and eventing. All of it is at grave risk of becoming an endangered species. Haertel believes her group has a lot of catch-up work to do in order to wield the clout of other, better-known land preservation groups. A lot of conservation efforts, such as American Farmland Trust, have been in the public eye-favorably-for decades. "Today, when you think of conserving land you think of farmland or wildlife," she rues. "In order to change that, the first thing we need to do is to get one group of riders working with another. "We're trying to create a unified voice for the entire industry," says the long-time advocacy worker. "We're bigger than the motion picture industry, but you'd never know it because we're not speaking with one voice. Dressage riders don't talk to trail riders who don't talk to hunter/jumpers." But the news isn't all dire. Haertel has found the economic clout of horse people can have a positive effect on grassroots efforts to maintain equine right-of-ways. To a greater or lesser extent, farriers, feed stores, tack shops, carpenters, hardware stores, farmers and truckers are all part of the equation. "Taking action is usually rewarded," she says. "It's like anything else; if you're organized, you've got a lot better chance of effecting change in your favor," she says. ELCR can provide the name of land trust(s) operating in your area and has a manual that outlines several methods for gaining equestrian rights at little or no cost. To learn more or to receive their Open Space Access Survey, contact ELCR by writing P. O. Box 335, Galena, IL 61036, calling (815) 776-0150 or visiting their website, www.elcr.org. "The first and best thing a rider can do is to join with local organizations that are working to preserve access," says Kandee Haertel. Saddle clubs or other groups that help maintain equestrian sites, such as county fairgrounds, are usually good starting points. Once you join, become active in the group. If you want to go a step farther, join a statewide group. Encourage groups, which tend to have membership based on discipline, to communicate with each other. Share success stories and work together on specific issues. Do your best to be a good neighbor, especially if you're the only horse owner around. Keep your place neat. You don't like flies, but your non-horsy neighbors hate them. And they'll blame you for every one they find in their homes. Keep your fences intact. When you're out riding and see your land manager-or whoever is in charge of your trails or showgrounds-smile. Wave. Stop and talk if you can. Thank him or her for letting you use the facility. Describe how much you enjoy the grounds and what a beautiful place it is. Do not start any conversation with, "You know there are some terrible potholes over there." If you come to a gate and it's closed, close it behind you. What do you think, you were raised in a barn? When you trailer out somewhere, pick up your horse's manure. To non-equestrians, manure is not as acceptable as it is to you. To them, it is not reprocessed grass. It is massive quantities of poop. "And I hate to have to say this, but it happens more often than you'd imagine," says Haertel. "Pick up manure when it is in a picnic area." 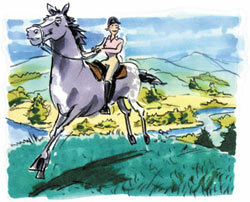 Read the next horse riding tips article on Curb Bits.